Dr. Doug Foster is the current director of the Center for Restoration Studies. The Center for Restoration Studies Collection is housed at the Brown Library on the campus of Abilene Christian University. The collection consists of bibliographic records, finding aids, and selected collections documenting the history of the Church of Christ Restoration Movement. 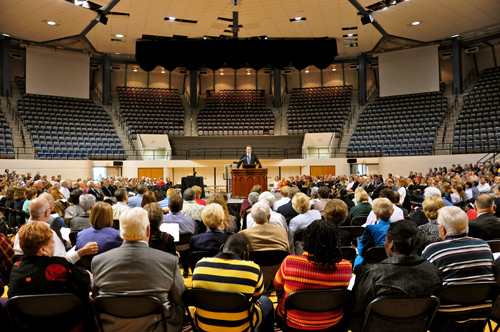 Dr. Doug Foster speaking during the Great Communion in Moody Coliseum, on Abilene Christian University’s campus. Research Interests: Reformation and modern Christianity, American Christianity, Stone-Campbell Movement history and theology, ecclesiology, and ecumenism. Personal Interests: Folk music, film, historical fiction, international travel. Courses Taught: History of American Christianity, Advanced Restoration History, History of Christianity II, Ecumenical Ecclesiology. One of three General Editors for The Encyclopedia of the Stone-Campbell Movement published by Eerdman’s. Co-editor and writer for new global history of the Stone-Campbell Movement. Author of Renewing God’s People: A Concise History of Churches of Christ published by ACU Press.